Home » Blog » Back Pain Resources » Why Do I Need Spine Surgery Again? Why Do I Need Spine Surgery Again? You finally had that back surgery, and you had high hopes it was going to fix your problem. But something’s still wrong. The problem lingers. You’re still in pain. It might even feel like you’re in more pain after the spine surgery. The surgery might seem like it’s only created a whole new host of problems. Having problems after back surgery is extremely frustrating. When you decide to undergo surgery, you put all your hopes into it. Sometimes it simply doesn’t get the job done. Other times it creates more problems than it solves. Everyone experiences discomfort after a surgery. It’s entirely natural, and while it’s unpleasant, it’s to be expected. As your body heals in the days and weeks after surgery, the pain should naturally lessen and eventually fade. However, if you’re still having pain months or years later, this might be a sign something is not right. Pain is a tool your body uses to tell you there’s a problem. If your back is still giving you constant pain, it might be time to talk to your doctor and see if a second back surgery is the right option for you. If you’ve already had a back surgery and are going to have a second one, this secondary surgery is known as revision surgery. As might be expected, the goal of revision surgery is to fix problems that were not entirely resolved by the initial surgery, as well as to address any problems created by the first surgery. And of course, another goal of revision surgery is also to relieve pain and increase comfort levels of patients. Most patients who decide to undergo revision surgery continue to experience chronic pain months or years after their initial surgery. Something has clearly gone wrong either during or after the initial surgery, and an additional procedure is deemed necessary to correct the problem. Problems After Back Surgery: What’s Causing Them? There could be unusual scar tissue around the surgery site. Perhaps the surgery site healed incorrectly, and this could be causing other problems in the spine. The surgery may have been successful, but perhaps the diagnosis was wrong and so the initial problem was still not fixed. The patient simply wasn’t a good candidate for the initial surgery in the first place. Due to certain health or lifestyle concerns, the patient’s body may have suffered during the rigors of the surgery, and it may not have healed correctly. It’s possible the surgery may have done more harm than good. Of course, ordinary post-surgical complications may also be causing problems, but that’s just one possibility out of many. Keep in mind it’s always best to talk to your doctor before attempting to self-diagnose a condition. The thought of still more surgery might be scary. But by gathering as much information as possible, you can be better prepared to understand your situation and face the future with optimism and confidence. With that in mind, here are some of the most likely causes of back pain after a surgery. While everyone’s case is different, all of these conditions can be cause for revision surgery. Please keep in mind this list should serve as a starting point to your research, not as a definitive guide with all the information you’ll need. Your primary resource in this process should always be your doctor or surgeon. Adjacent Segment Disease is an advanced form of Adjacent Segment Degeneration. Basically, it’s a term for a condition that occurs within spines after they’ve been operated on. It means an anatomical change has taken place in the joints around the spinal joint that was operated on. This change is sometimes abbreviated from Adjacent Segment Disease to ASD. Scientists still have yet to determine if the surgery itself causes ASD or if it’s just the natural continuing degeneration of the spine that’s responsible. It might be the patient would still have developed ASD symptoms even without the initial surgery. Your body then has to make up for this loss. The surrounding joints essentially pick up the slack for the joint that no longer moves. This adds more stress to the surrounding joints and causes them to degenerate at a much faster rate than they would have ordinarily. One of the aspects of ASD that can make it particularly frustrating is that it doesn’t typically occur right away. You might have a year, two years or even three years without pain after your surgery before ASD begins to rear its ugly head. Revision surgery is a possibility in order to correct the problems in the affected joints. One possible such surgery is total disc replacement. This problem sometimes arises after having a discectomy. Essentially, this problem is nothing more than a repeat of the original problem that led to the first surgery. Symptoms of this problem include sciatica, or a shooting pain running down your arm, and other classic symptoms of a basic herniated disc. During the discectomy, the surgeon only removes the fragments that have become detached from the main damaged disc. The disc itself remains intact, aside from the fragments the surgeon removed. Unfortunately, this means it might be just as susceptible to herniation as it was before. The revision surgery works exactly like the first. The unusable pieces of the disc are cleared away, leaving the only good parts of the disc. This problem occurs after a spinal fusion surgery and is more common than you might initially think. The term “pseudoarthrosis” simply refers to a lack of bone fusion following the initial fusion surgery. It means the original surgery was a failure. The bone did not heal correctly, and the operation was unsuccessful. It usually occurs less than a year after the initial surgery. Surprisingly enough, it occurs in roughly 68% of spinal fusions. Out of this 68%, anywhere between 6 and 36% end up needing revision surgery. Studies have shown fusion surgeries done without any kind of hardware implementation can actually increase your risk of developing pseudoarthrosis by up to 70%. Your risk of developing this condition is also affected by numerous other factors. These include your original diagnosis, any pre-existing health concerns, lifestyle concerns such as smoking and the type of bone graft used, if any. It might be confusing to see smoking included in this list, but there’s actually a strong connection between smoking and candidacy for this kind of surgery. Smoking leads to constricted blood vessels, which then leads to decreased blood flow to the area of the fusion. 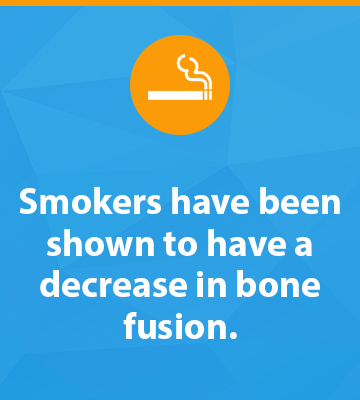 Because of this, smokers have been shown to have a decrease in bone fusion. If pain-relief medication has been tried and been ineffective, a second spinal fusion surgery might be necessary to correct this problem. Total Disc Replacement, also known as TDR, is still a relatively new procedure. While this shouldn’t discourage you from getting this type of surgery, the risk of complications occurring during or after could be a bit higher than they might be for practices that have been around for longer. One of the things that might go wrong with this surgery is the hardware itself. While it’s possible for the prosthetic disc in your spine to malfunction, it’s much more likely to have simply been positioned incorrectly. Because the purpose of TDR is to replace the damaged disc entirely and thus preserve the full range of motion, the problems could stem from the regular degenerative progress of the nearby spinal joints. If the pain from this problem becomes too severe, revision fusion surgery may be the right solution. This isn’t an extremely common case, but it’s still a possibility. As part of spinal surgery, you may have had certain types of hardware implemented into your spine. This could include but is not limited to prosthetic discs, pins, screws or any kind of hardware used for spinal fusion. Cases where the implanted hardware causes problems are known generally as “painful hardware.” And while you might expect this is typically a problem with the hardware itself, more often than not the problem is a matter of misplaced hardware. The misplacement can cause pain that’s anywhere from moderate to severe. Very rarely, however, hardware can actually break inside your body. Understandably, this can cause a significant amount of pain as well. When revision surgery is necessary because of hardware problems, the purpose of the surgery is usually not to remove the offending device. Instead, the purpose is to adjust the placement, which is the most likely the cause of the pain. In most cases, this type of problem will not take years to surface. If there are indeed problems with your hardware, you will most likely notice them fairly quickly, and the revision surgery will usually take place right away. Now that you’re informed about some of the possibilities that could cause you pain, let’s look at the next steps you should take. Your first step should always be to call your doctor. If the pain has gotten to the point where it’s interrupting your daily life, don’t wait. Set up an appointment with your doctor and explain what’s been going on. Your doctor will probably ask you to explain the symptoms you’ve been experiencing and review the level of pain you’ve been suffering. While this might be a stressful step for some, it’s also an important one as it’s essential for your doctor to understand what’s really going on and come up with the best treatment options for you. Your doctor will also probably review your history of treatment, including past surgeries, past symptoms and past pain levels. Again, all this will help them understand what might be going wrong now. There will probably be a standard physical exam to check for simpler solutions to your pain and also to make sure you’re in good health other than your back pain. Depending on your situation, this exam will most likely be followed by a more thorough testing with an X-ray, a CT scan or an MRI. This will help your doctor get a better look at your spine and maybe get an idea of what’s causing your pain and how best to treat it. After this examination, it’s important for you and your doctor to sit down together and talk things through. Treatment options will vary depending on your situation. Revision surgery might be an option, or it might not. Physical therapy might relieve your pain and help correct the problem without undergoing a second surgery. Sometimes even diet and regular exercise can do wonders to improve pain levels. A second surgery might not be the solution right for your body, but it’s worth talking it over with your doctor. This will help you to be more informed and more aware of the options available to you. By openly communicating with your doctor and doing everything you can to learn more about your condition, you can gain confidence about your options. It’s important to realize that while your doctor will certainly have recommendations, the decision is ultimately yours to make. A doctor can tell you if revision surgery is likely to help you or not. But the decision to have revision surgery or not is up to you. After all this talk of things that have the potential to go wrong with spinal surgery, having a second spinal surgery is probably the last thing you want to do. But in reality, there are more benefits to it than you might initially think. With a second surgery, the doctors and surgeons will have even more knowledge than they did for the first operation. They will be more likely to know your body’s tendencies. This means they will be better able to anticipate problems your body might have and better able to take steps to prevent them. You have a busy, full life to live. If your back causes you so much pain it’s interfering with the way you want to live your life, then it’s worth the surgery. By choosing to undergo a second surgery, you can get busy looking forward to having your life back — free from pain and full of plans for the future. If you need a qualified doctor’s opinion on your revision surgery, contact NJ Spine & Orthopedic today for more information.